It has gotten cold here again which makes me want to do nothing but sit under a blanket and drink hot chocolate. Maybe I will warm the house up with the oven and make a batch of hot chocolate cupcakes to go with it. You know, because you need a cupcake with your hot chocolate. 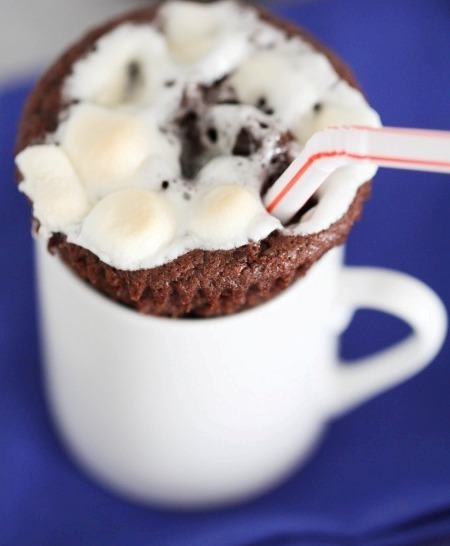 Even if you don't want to try this delicious looking hot chocolate cupcake, you have to admit you sort of want to serve all of your cupcakes in a mug like this. Although the straw has me thinking that a different cup would make a cute milkshake cupcake too. The hot chocolate cupcake recipe fromt Cupcakes for Party seems to no longer be available, but Food Network has a hot chocolate cupcake recipe you can check out. I actually just saw these in an old Family Fun magazine but they suggested using clear coffee mugs which I thought I could pick up at the dollar store, great idea and looks soooo yummy! that blog no longer exists- when I click the link to get the recipe, that's the message I'm getting!